The Veterans Treatment Court takes a team approach to rehabilitate veterans with post-traumatic stress disorder (PTSD) or traumatic brain injury (TBI) who have been charged with a misdemeanor crime. Your donation to the Veterans Treatment Court will go towards obtaining various necessary resources for participants in the program such as bus passes (transportation to and from required meetings and counseling), temporary housing, required testing fees, etc. Henderson Municipal Judge Mark Stevens established the Veterans Treatment Court in 2011 after the Nevada Legislature authorized the specialty court. Judge Stevens is a military veteran himself, and wanted to reach out to his fellow veterans. He aspired to provide an avenue of support and rehabilitation for those veterans returning to civilian life after their service to our country but who ran into issues with the law. Defendants interested in participating in Veterans Treatment Court are referred to the program by their attorney, the prosecuting attorney, or other courts. Though participation in the program is voluntary, the Veterans Treatment Court team must approve participation eligibility. In cases such as domestic violence, additional approval for the veteran’s participation in the program must come from the victim. The Veterans Treatment Court seeks to address root-cause issues that these veterans may be facing and provides access to, as needed, court-ordered counseling, Veterans Administration recommended counseling (i.e. Post-Traumatic Stress Disorder counseling, mental health counseling, and drug and alcohol counseling) as well as other treatment needs. Participants in the Veterans Treatment Court may also be subject to other requirements of the court, such as random drug and alcohol testing and completion of community service and/or a work program. Participants are also paired with volunteer mentors, who are veterans themselves, to give participants both a much-needed sounding board and an accountability partner in their journey through the program. Participants who successfully complete the program requirements may have their charge amended, dismissed, or conditionally dismissed. For DUI and Domestic Battery offenses, the Court will conditionally dismiss the charge after graduation. Conditionally dismissed charges still constitute a prior offense for enhancement purposes if the defendant is subsequently charged with another DUI or Domestic Battery offense within seven years, therefore these records are not automatically sealed upon the completion of the program. However, after the seven year period, the defendant may file a petition with the Court to have the records sealed. For other offense types that result in dismissal, the participant’s records will be sealed upon graduation. The program is a minimum of one year if the participant is in full compliance, and will be extended if non-compliant at any time throughout the program. The Henderson Veterans Treatment Court is a specialty court in the City of Henderson Municipal Court system. 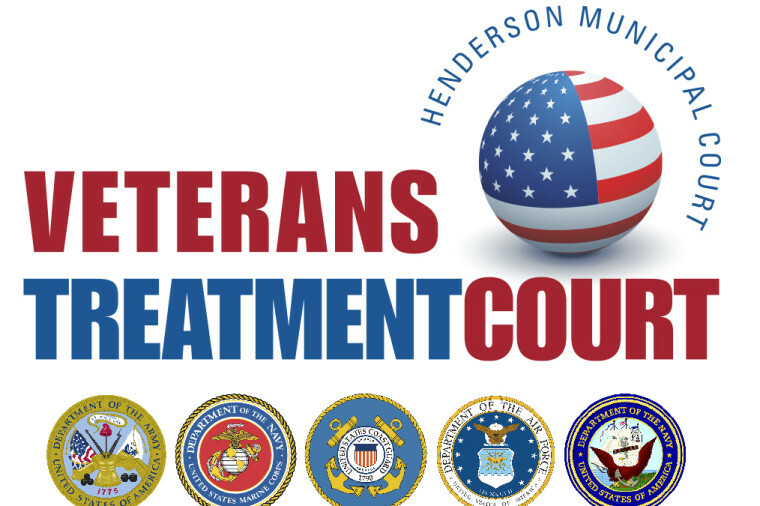 Veterans Treatment Court is a component fund of the Henderson Community Foundation, a recognized 501(c)3 corporation in the state of Nevada. May 9, 2019 at 2 p.m.
A special thank you to Henderson Chamber of Commerce and Chimera Golf Club for a wonderful golf tournament on October 26, 2015 benefitting Veterans Treatment Court and the Henderson Chamber of Commerce Foundation. Veterans are needed to mentor participants.